In a nutshell: Food garlic is generally the comprised of the prettier, smaller bulbs of the season. Seed garlic is typically the largest of the harvest’s bulbs. Garlic meant for seed is often left to grow for a couple more weeks than garlic that will be sold as food. The purpose of this extra time is to allow for as much growth of the cloves as possible, as larger seeds (cloves) can produce larger bulbs in the next harvest. While the variety remains unchanged by this extra maturation time in terms of flavor or genetics, the resulting bulbs are often larger and may have a “less pretty” appearance. The two most common effects in addition to clove size are discoloration of the wrapper around the bulb, and the loss of some of the wrapper layers. Also, larger bulbs often don’t last as long in the cupboard and smaller bulbs do. NOTE: Some years, the wrappers are not affected or are minimally affected. But in some years, the wrappers may have a less-bright-white color, and some cloves may burst through the wrappers. In particular, artichoke softnecks are more susceptible. Some hardnecks may lose wrappers and become less white as well. This later harvest is not detrimental to the garlic as seed, and in fact, the larger seed is desirable for planting! Some growers may choose to bleach or use other detergents to wash their wrappers so the bulb wrappers appear brighter white. We do not attempt to alter color with chemicals. A comparison of bulb wrapper colors, using German Red as an example. 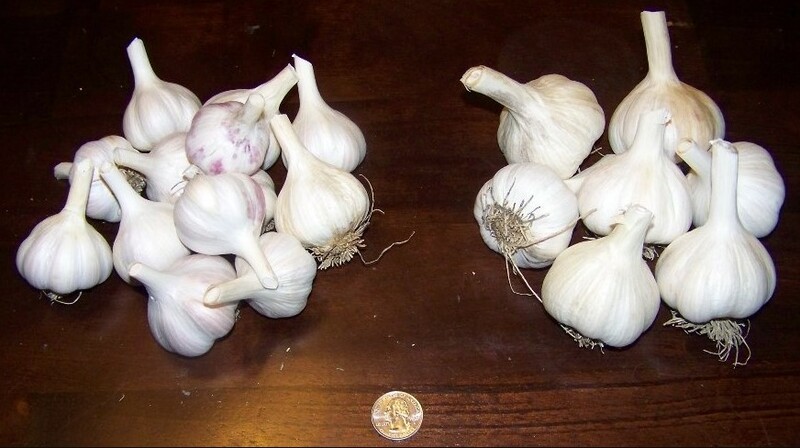 On the left is one pound of German Red, smaller-sized food-quality bulbs with white wrappers. On the right is one pound of German Red, showing a less white wrapper color and larger size. Examples of softnecks in a cold and wet year, which have stained wrappers and blown wrappers. Not all years’ weather/growing conditions result in this much change, but these pictures from an extremely-wet year show it clearly. This is not a problem for seed garlic, but definitely is an example of how seed garlic “can” be less pretty than the food bulbs. Can Seed Garlic Be Eaten? Yes. We obviously eat the garlic we raise. The garlic’s flavor characteristics are not changed by a longer growth period before harvest. Generally, the only difference between seed garlic and food garlic is, at times, a change in wrapper color and the loss of some wrapping. However, bulbs without wrappers probably won’t store as long in the cabinet. Therefore, the advantage of harvesting late is seed and bulb growth, but not storage length.